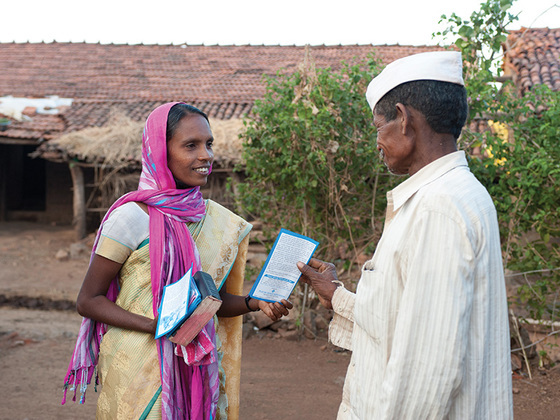 Pieces of literature help answer questions that people like Niriksh (not pictured) often have about Jesus. Niriksh was impressed by what he saw. The elderly man sat at a distance, watching a group of 50 women who had gathered in an open space below. At the front of the crowd stood the women from a local Women’s Fellowship group who had organized the meeting. It was September 8, World Literacy Day. They shared about the significance and importance of education, and several women from the village came forward at the end, eager to participate in a Gospel for Asia - supported literacy class. The Women’s Fellowship sisters had seen Niriksh, and after the event, they went over to speak with him. “You are doing a very good work,” Niriksh said to the women shortly after they approached. As the conversation continued, one of the women offered Niriksh a piece of literature. The women explained the piece of literature, and the conversation turned to the church and Jesus. Seeking more information, Niriksh learned about Jesus’ miraculous birth, death and resurrection. As Niriksh heard the story, excitement stirred within him. He joyfully took hold of Jesus’ offer of eternal life and begged the Women’s Fellowship team to visit his wife and tell her the same thing they had told him. At his request, the sisters visited Niriksh’s wife later that day and told her the message of great joy as well. She, too, chose to take hold of the Savior’s hand. Within a couple years after that day, Niriksh and his wife both passed away. Today, they’re enjoying fellowship with Christ, face to face. Just like Niriksh’s, our lives on earth will come to a close someday. Thank you for investing yourself into seeing more people like Niriksh understand the grace of our Savior.